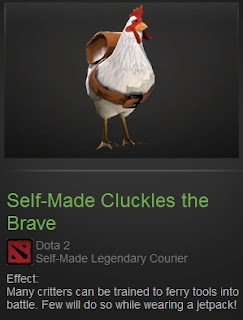 Valve has finally added the much awaited DotA chicken courier to the Dota 2 Store. The chicken courier has been the Neutral Creeps' mascot since 2008 so we caught up with Andrew Helenek (tG.Helenek) to find out the story behind the port of the iconic chicken to Valve's Dota 2. Hi Andrew. How long have you been in the Dota 2 beta? I got my invite last in the group that put the chicken together but we’ve all be playing the game for quite a while, since early 2012. We’re all avid fans of the game and play together whenever we get the chance. Did you guys have any prior Warcraft 3 DotA experience? We all played the original DOTA, but we’ve always loved the series and were overjoyed when we found out Valve was going to behind it. Tell us the story on how you guys got together to work on the project. Its funny, our little online group have been playing video games for years together. We’re all friends there except one but on the day Valve released the Workshop, we started jokingly talking about how we could make some items for the game and maybe get them accept into the game. I started thinking about what we could create and noticed the lack of Chicken in Dota 2. A few nights later, I gathered everyone up and told them, "Lets do it, for real." Everyone in our little online group had a skillset that could be used in its creation. Bewsii was an all-star modeler, Cherrii was a fantastic rigger, I focused on animation and co-led the group with Qwiggalo who was our generalist and quality control guy. But we lacked a texture artist, thankfully we were good friends with Cyborgmatt who happened to know one, J4CK, and put us in contact with him. Our team was assembled and we got to work. We did run into a few problems and luckily ‘Bert came in the clutch right at the end and helped us get it working in game. How long did it take for you guys to go from an idea to the final addition to the Dota 2 store? It was quite a long process and there were some hurdles we overcame. We started the chicken on June 4, 2012 and we didn’t get what it looks like right now until December. We spent months perfecting every little detail and waiting for Valve's response from time to time. (haha!) By the end of December, Valve gave us the confirmation that they did plan on shipping it, but it took another month or two to get it polished and ready for shipment. I want to thank everyone that supported us while we were creating this! We made this for the fans of the original DOTA that miss calling the chicken, chicken! All of the comments shouting at us to get it done drove us to its completion, so thank you guys so much! We’re very happy we can give something to the community that we ourselves take part in! I also want to give a big shoutout to Team Gabe! Valve for creating what will become one of the greatest games in gaming history, and for having the workshop and allowing its users to participate in the creation of items for their game. Congratulations to the Cluckles the Brave team! Buy your own Dota 2 chicken! i dont lose anything for asking! !